Hi everyone! Today the blog that was promised. 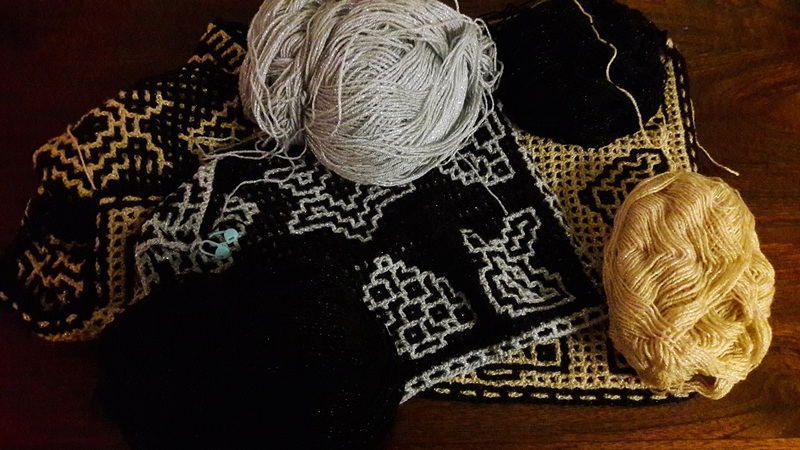 I wasn’t feeling well this week, so I published the new pattern a day earlier when I felt things going down, but without the accompanying blog. Some of you are already finished with the new pattern! But here is the blog. I’m doing fine again by the way! Thank you very much for all you kind wishes! It was nice to see that you also liked the butterflies so much. There even was a person that used this pattern and the suns to make a very cute doll blanket. Really fun to see the technique is picked up so well, and that it is used for other applications! It really feels to me like ‘mission accomplished’. I saw some people using the HAL CAL in a smaller version as a table runner, and I thought then that it would probably be fun to have a table runner with christmas motifs. That had to be made super quickly, because, before you know it, it is christmas, and it would be nice to have it on the table in time. Okay, it will be christmas next year again, but I thought it would be fun to do when still in the ‘interwoven crochet mood’. You can look on the page here for more info and pictures, and for the discount: https://www.dehandwerkjuf.nl/en/premiere-the-patterns-for-the-christmas-table-runners-are-for-sale-with-a-discount/. You didn’t know of course that I was working on something extra, because I kept it a secret for a while. I found that there could be made something with the leftover yarns. I announced it as a search on the website, because I secretly added it to the release schedule. You found it quite quickly 🙂 . So there will be an extra week after finishing the blanket. What it will be is a secret again of course 🙂 , but there is a hint about the pattern (for the Dutch this is a familiar old song). Okay, enough chitchat. For those who didn’t see it yet, this week the towers are released. I thought about towers because of the series Frasier. Google on ‘music of frasier series’ and look at the pictures you will get as a result. That was my association with it, but I can imagine you see something totally different in it. I also needed something to get you guessing, and it turned out it was not that weird, because someone guessed it right! I surely didn’t expect that 🙂 . And the next week the finale!! !